Can I use the Fritz Algae Clean Out to prevent algae growth starting? 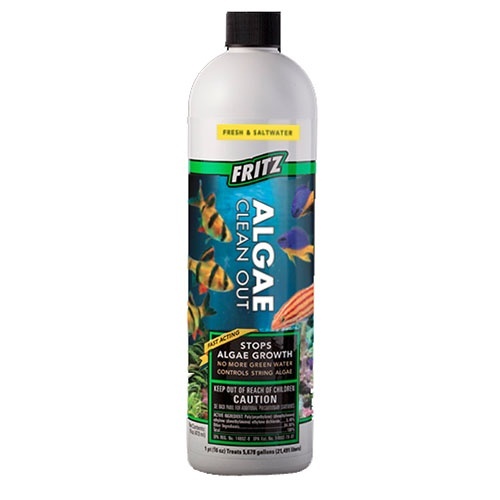 Fritz Algae Clean Out is formulated specifically to treat existing algae problems, we do not recommend using as a preventative. We do recommend using FritzZyme 360 or FritzZyme 460 to get phosphates and nitrates udner control which lead to future algae break outs. The bottle says "Safe for Saltwater", is this reef safe? Yes, extensive testing a shown Fritz Algae Clean Out to be reef safe when used as directed. After using, my algae came back after a month! What gives? 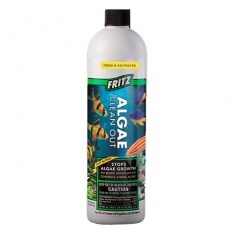 Fritz Algae Clean Out is an algaecide that effectively, rapidly eliminates existing algae growth. It does not prevent new algae growth from occurring. To prevent that, you have to remove any excess nutrients (foods, phosphates, direct sunlight) from your aquarium or pond. Ornamental plants can be used to consume some of those excess nutrients; heterotrophic bacteria such as in our FritzZyme 360 and FritzZyme 460 products. I have a really bad algae problem, can I double the dosage? No. It is not safe or recommended to exceed the label dosage. Use repeat dosages per the directions if needed and find out what is causing the algae growth: phosphates, uneaten foods, hours of direct sunlight, etc.